1. A series of strategically located unobtrusive nozzles are flush-mounted in your pool floor. 2. In a carefully orchestrated, automatically regulated, and completely silent sequence, each rotating nozzle pops up in turn. 3. Throughout the sequence, powerful streams of freshly filtered water push dirt and debris into the Vantage collection zone. 4. A fixed nozzle then pushes the dirt and debris into the main drain where it is collected in the debris canister. With more than 10,000 Compass Vantage pools in the ground, we know the Compass Vantage operating system works. It works extremely well.  Vantage offers you more than superior cleaning. It delivers the total package in the care of your pool water. You can see and feel the difference of a Compass Vantage pool! For everyone, pools are a great source of fun. They are wonderfully relaxing and perfect for low impact healthy exercise. And for some, cleaning the pool is part of the fun. For everyone else, the Compass Vantage pool cleans itself. Water needs to flow. Water must flow. In its natural state, water is constantly moving. When it stops it stagnates and becomes contaminated with algae and bacteria. Like a mount stream, a Compass Vantage system regularly circulates and constantly refreshes the water in your pool. The sun ‘burns off’ your vital and valuable pool chemicals. 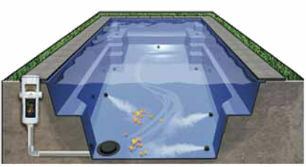 Unlike conventional pool circulation systems, the Vantage system circulates your pool from bottom to top. All of the layers of the pool water are penetrated, eliminating ‘dead spots’ where algae and bacteria grow. With Vantage you make dramatic savings on chemical usage while enjoying a cleaner, healthier pool.